For other uses, see Lord of the manor (disambiguation). the seignory, rights granted to the titular holder of the manor. A title similar to such a lordship is known in French as Seigneur du Manoir, Welsh as Breyr, Gutsherr in German, Godsherre in Norwegian and Swedish, Ambachtsheer in Dutch and Signore or Vassallo in Italian. Historically a lord of the manor might be a tenant-in-chief if he held a capital manor directly from the Crown; otherwise he was a mesne lord if he did not hold directly from the Crown, yet had his own tenants. The origins of the lordship of manors arose in the Anglo-Saxon system of manorialism. Following the Norman conquest, land at the manorial level was recorded in the Domesday Book of 1086 (the Normans' registry in Sicily was called, in Latin, the Catalogus Baronum, compiled a few years later). The title cannot nowadays be subdivided. This has been prohibited since 1290 in the Statute of Quia Emptores that prevents tenants from alienating their lands to others by subinfeudation, instead requiring all tenants wishing to alienate their land to do so by substitution. In medieval times the manor was the nucleus of English rural life. It was an administrative unit of an extensive area of land. The whole of it was owned originally by the lord of the manor. He lived in the big house called the manor house. Attached to it were many acres of grassland and woodlands called the park. These were the “demesne lands” which were for the personal use of the lord of the manor. Dotted all round were the enclosed homes and land occupied by the “tenants of the manor”. A manorial lordship is not a noble title, but a semi-extinct form of landed property. Lordship in this sense is a synonym for ownership, although this ownership involved a historic legal jurisdiction in the form of the court baron. The journal Justice of the Peace & Local Government Law advises that the position is unclear as to whether a lordship of a manor is a title of honour or a dignity, as this is yet to be tested by the courts. Technically, lords of manors are barons, or freemen; however, they do not use the term as a title. John Selden in his esteemed work Titles of Honour writes, "The word Baro (Latin for Baron) hath been also so much communicated, that not only all Lords of Manors have been from ancient time, and are at this day called sometimes Barons (as in the stile of their Court Barons, which is Curia Baronis, &c. And I have read hors de son Barony in a barr to an Avowry for hors de son fee) But also the Judges of the Exchequer have it from antient time fixed on them." John Martin Robinson, Maltravers Herald Extraordinary and co-author of The Oxford Guide to Heraldry, gave his opinion that "Lordship of this or that manor is no more a title than Landlord of The Dog and Duck". The style 'Lord of the Manor of X' or 'Lord of X' is, in this sense, more of a description than a title, somewhat similar to the term Laird in Scotland. King's College, Cambridge have given the view that the term 'indicated wealth and privilege, and it carried rights and responsibilities'. Since 1965 Lords of the Manor have been entitled to compensation in the event of compulsory purchase. Before the Land Registration Act 2002 it was possible for manors to be registered with HM Land Registry. Manorial incidents, which are the rights that a lord of the manor may exercise over other people's land, lapsed on 12 October 2013 if not registered by then with the Land Registry. This is a separate issue to the registration of lordships of manors, since both registered and unregistered lordships will continue to exist after that date. It is only their practical rights that will lose what is called 'overriding interest', or in other words the ability to affect land even if the interests or rights are not registered against that land, as of 12 October 2013. Manorial incidents can still be recorded for either registered or unregistered manors; however, proof of existence of the rights may need to be submitted to the Land Registry before they will be noted and they may not be registered at all after affected land is sold after 12 October 2013. This issue does not affect the existence of the title of lord of the manor. There have been cases where manors have been sold and the seller has unknowingly parted with rights to unregistered land in England and Wales. In England in the Middle Ages, land was held of the English monarch or ruler by a powerful local supporter, who gave protection in return. The people who had sworn homage to the lord were known as vassals. Vassals were nobles who served loyalty for the king, in return for being given the use of land. After the Norman conquest of England, however, all land in England was owned by the monarch who then granted the use of it by means of a transaction known as enfeoffment, to earls, barons, and others, in return for military service. The person who held feudal land directly from the king was known as a tenant-in-chief (see also Land tenure). Military service was based upon units of ten knights (see Knight-service). An important tenant-in-chief might be expected to provide all ten knights, and lesser tenants-in-chief, half of one. Some tenants-in-chief 'sub-infeuded', that is, granted, some land to a sub-tenant. Further sub-infeudation could occur down to the level of a lord of a single manor, which in itself might represent only a fraction of a knight's fee. A mesne lord was the level of lord in the middle holding several manors, between the lords of a manor and the superior lord. The sub-tenant might have to provide knight-service, or finance just a portion of it, or pay something purely nominal. Any further sub-infeudation was prohibited by the Statute of Quia Emptores in 1290. Knight-service was abolished by the Tenures Abolition Act 1660. 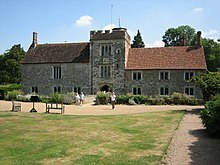 Manors were defined as an area of land and became closely associated to the advowson of the church and often by default the advowson was appended to the rights of the Manor, sometimes separated into moieties. Many lords of the manor were known as squires, at a time when land ownership was the basis of power. While some inhabitants were serfs who were bound to the land, others were freeholders, known as 'franklins', who were free from feudal service. Periodically all the tenants met at a 'manorial court', with the lord of the manor (or squire), or a steward, as chairman. These courts, known as courts baron, dealt with the tenants' rights and duties, changes of occupancy, and disputes between tenants. Some manorial courts also had the status of a court leet, and so they elected constables and other officials and were effectively magistrates' courts for minor offences. The tenure of the freeholders was protected by the royal courts. After the Black Death, labour was in demand and so it became difficult for the lords of manors to impose duties on serfs. However their customary tenure continued and in the 16th century the royal courts also began to protect these customary tenants, who became known as copyholders. The name arises because the tenant was given a copy of the court's record of the fact as a title deed. During the 19th century manor courts were phased out. In 1925, copyhold tenure formally ended with the enactment of Law of Property Acts, 1922 and 1924, converting copyhold to fee simple. Although copyhold was abolished, the title of Lord of the Manor remains, and certain rights attached to it will also remain if registered under the Land Registration Act 2002, which Act ended manorial incidents unprotected by registration at HM Land Registry after October 2013. The Land Registration Act 2002 does not affect the existence of unregistered lordships after October 2013, only the rights that would have previously been attached to the same. During the latter part of the 20th century, many of these titles were sold to wealthy individuals seeking a distinction. However, certain purchasers, such as Mark Roberts, controversially exploited the right to claim unregistered land. A manorial title (i.e. Lord of the Manor) is not a title of nobility, as in a peerage title. Manor house in Crofton, Yorks. Feudal lordships of the manor exist today in English property law, being legal titles historically dating back to the Norman invasion of England in 1066. Being incorporated into property law (whether physical or non-physical) they can be bought and sold, as historic artifacts. The title itself as stated below can be separated from the physical property just as any other right can. Rights like the lordship, mineral and sporting can all be separate from the physical property. The title since 1290 cannot be sub-divided. Land, sporting rights, and mineral rights can be separated. Property lawyers usually handle such transactions. the seignory – these are the rights granted to the holder of the manor. These three elements may exist separately or be combined, the first element being the title may be held in moieties and may not be subdivided, this is prohibited by the Statute of Quia Emptores preventing subinfeudation whereas the second and third elements can be subdivided. The Historical Manuscripts Commission maintains two Manorial Document Registers that cover southern England. One register is arranged under parishes, the other is arranged under manors and shows the last-known whereabouts of the manorial records, the records are often very limited. The National Archives at Kew, London and County Record Offices maintain many documents that mention manors or manorial rights, in some cases manorial court rolls have survived, such documents are now protected by law. The issues of land claims were raised in the UK Parliament in 2004 and were debated with a reply on the subject from the Parliamentary Under-Secretary of State for Constitutional Affairs acknowledging 'need for reform of the remnants of feudal and manorial law' as a case was highlighted in Peterstone Wentloog, Wales, where villagers were being charged excessive fees to cross manorial land to access their homes. In 2007, a caution against first registration caused houses to stop selling in Alstonefield after Mark Roberts, a businessman from Wales also previously involved in the Peterstone Wentloog case, registered a caution against first registration for 25,000 acres (100 km2) after purchasing the lordship of the manor of Alstonefield for £10,000 in 1999. Judith Bray, land law expert from Buckingham University, speaking to BBC about the case, said that "the legal situation is very confusing because a piece of legislation in the 1920s separated manorial rights from the ownership of land." In reports about the Alstonefield case, the BBC stated, "Scores of titles are bought and sold every year, some like the one Chris Eubank bought for fun, others seen as a business opportunity. It is entirely lawful, and there is no doubt the titles can be valuable. As well as rights to land like wastes and commons, they can also give the holder rights over land." The report goes on to say that the Law Commission in England and Wales were considering a project to abolish feudal land law but would not review manorial rights. In many cases, a title of lord of the manor may not have any land or rights, and in such cases the title is known as an 'incorporeal hereditament'. Before the Land Registration Act 2002 it was possible to volunteer to register lordship titles with HM Land Registry; most did not seek to register. Dealings in previously registered Manors are subject to compulsory registration; however, lords of manors may opt to de-register their titles and they will continue to exist unregistered. Manorial rights such as mineral rights will no longer be able to become registerable after midnight 12 October 2013. A manorial lordship or ladyship is not connected to the British honours system, but rather the feudal system. Ownership of a manorial lordship can be noted on request in British passports through an official observation worded, 'The Holder is the Lord of the Manor of ................'. The feudal title of lord of the manor, unlike titles of peerage, can be inherited by females. In addition it is the only title that can be purchased. Lordships of the manor are considered non-physical property in England and are fully enforceable in the English court system. Like their English counterparts, by 1600 manorial titles in the formerly Norman territories in France and Italy did not ennoble their holders in the same way as, for example, did a barony. The status of lord of the manor is associated with the rank of esquire by prescription. There were fears in 2014 and earlier, that holders of the manorial rights would allow fracking under the homes and near local communities of people living within the manorial estate after a disclosure that 73,000 applications to assert manorial mineral rights had been received by the land registry. Many of the applications received were from the Duchy of Lancaster and the Duchy of Cornwall asserting their historic "manorial mineral ownership". ^ Sir William Searle. An historical introduction to the land law page 105 & page 106. Google Books Preview. ^ Selden, J. (1672). Titles of Honor: By the Late and Famous Antiquary John Selden of Inner Temple, Esquire (Third ed.). London: Thomas Dring. p. 570. ^ "The Court of the Lord Lyon, Lairds". Archived from the original on 2012-07-28. Retrieved 2019-01-13. ^ "Compulsory Purchase Act 1965". legislation.gov.uk. HMSO. Retrieved 19 August 2014. ^ a b c d "To The Manor Bought". BBC News. 31 July 2007. ^ Frank Hinks (2008-09-04). "To the manor bought". Legal Week. Archived from the original on 2008-11-18. Retrieved 2008-09-05. ^ a b "Titles included in passports" (PDF). Home Office. United Kingdom. ^ Young, John H. (1881). Our Deportment, Or the Manners, Conduct and Dress of the Most Refined Society; Including Forms for Letters, Invitations, Etc., Etc. Also, Valuable Suggestions on Home Culture and Training, F.B. Dickerson & Co./Pennsylvania Publishing House/Union Publishing House. Detroit, Mich./Harrisburgh, Pa./Chicago, Ill.
^ Gray, Louise. "'Lords of the Manor' to cash in on 'fracking'". Telegraph. Retrieved 7 February 2014. ^ Gosden, Emily. "Fracking fears as landowners lay claim to ancient rights". Telegraph. Retrieved 7 February 2014.